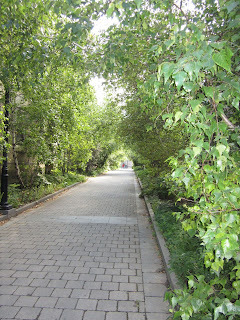 The first stitch I posted a picture for was the Cloisters. 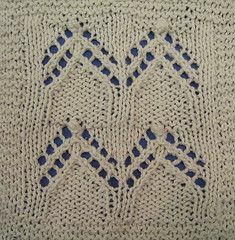 I really just looked at the stitch and admired how it resembled the arch of a cloister. Here is the stitch again. I have since then done some research on cloisters to add a little more meaning to the stitch. Cloisters are essentially covered walkways. They were often part of monasteries as a symbolic way of separating spiritual life from the chaos of peasant life. To be cloistered is to be sheltered from the fray in a contemplative life style that only a religious and later an academic institution could support. 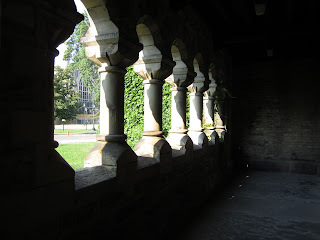 Here is a small cloister from University College University of Toronto. I was hoping to be able to get into the main quadrangle, which is edged by a magnificent cloister. Unfortunately the huge wooden doors were always closed. I guess I'll have to go back in September. I was, though, able to get this picture of a covered walkway. Cloisters created by nature are lovely too and offer a much needed escape from the material world. However in the absence of any clearly defined physical refuge - a ball of yarn and some circular needles can create it's own escape.